Several investigations, including magnetic resonance imaging (MRI), computed tomography (CT), and orbital ultrasound are used to non-invasively screen for carotid cavernous fistula (CCF), with variable results. Examination of magnetic resonance angiography (MRA) source images, in addition to the conventional MRA reconstructions, is now also recognised as a useful method of detecting CCF.1 The finding of a hyperintense signal in the cavernous sinus on MRA source imaging provides additional, and sometimes the only, neuroradiographic CCF evidence. We present this patient to familiarise the ophthalmologist with the typical CCF appearance on MRA source images. A 59 year old woman with a left eye pressure sensation and a four year history of left ear pulse-synchronous “buzzing” was found to have elevated left intraocular pressure (26 mmHg) on routine examination. She denied diplopia, visual blurring, or pain. Visual acuity was 20/25 OD and 20/20 OS. Colour vision, visual fields, and pupils were normal. There was left proptosis, ptosis, and dilated episcleral vessels. Optic discs were normal and there was mild left retinal venous engorgement. There was a left supraorbital pulse-synchronous bruit. Carotid cavernous fistula was suspected. 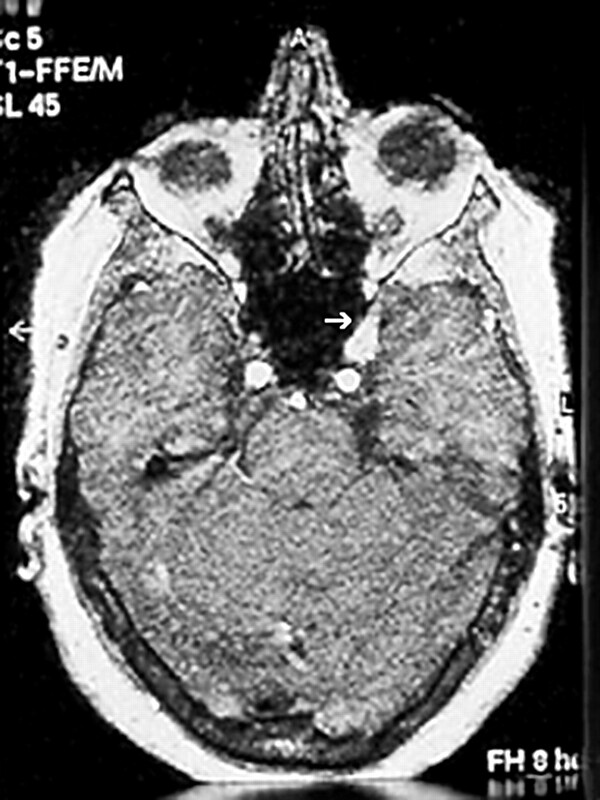 T1-weighted brain MRI showed left superior ophthalmic vein (SOV) enlargement (Fig 1). The cavernous sinuses were symmetric and normal in size, with slightly increased flow voids in the left cavernous sinus. Conventional reconstructed MRA did not reveal a fistula. However, MRA source images showed an enlarged, hyperintense left cavernous sinus (Fig 2), supporting the presence of a CCF. Cerebral angiography confirmed a left dural CCF. Following endovascular therapy with transvenous and transarterial embolisation of the fistula, all abnormal findings resolved. 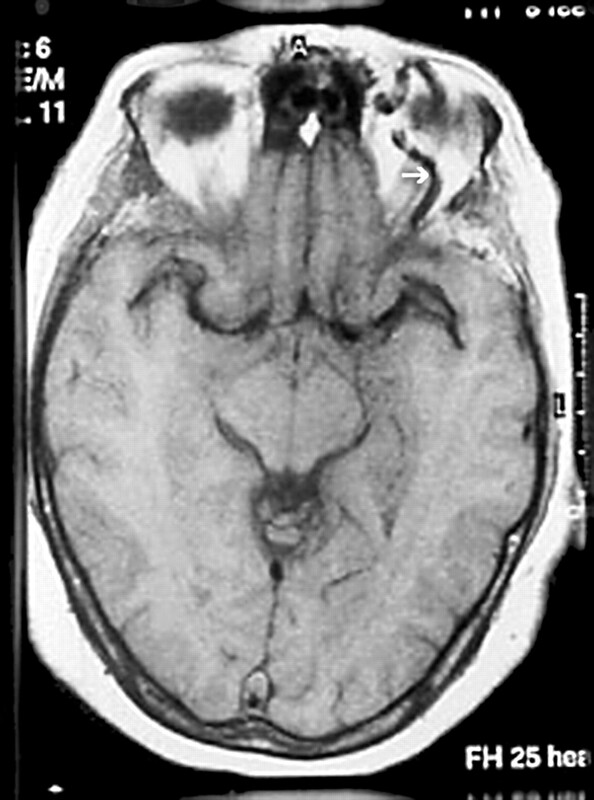 T1-weighted axial magnetic resonance image. There is dilation of the left superior ophthalmic vein (arrow). Magnetic resonance angiography source image shows an enlarged, hyperintense left cavernous sinus (arrow). Carotid cavernous fistulas are abnormal communications between the carotid artery and the cavernous sinus, either directly or via intradural branches of the internal or external carotid arteries.1 Direct fistulas are high flow, frequently follow trauma, and tend to have a dramatic clinical presentation. In contrast, indirect fistulas are low flow, often spontaneous, and may have a subtle clinical presentation. Symptoms and signs common to both types of fistulas include proptosis, chemosis, diplopia, visual loss, pulse-synchronous tinnitus, orbital bruit, elevated intraocular pressure, dilated episcleral veins, and retinal venous congestion. The pattern of venous drainage, either anterior into the ophthalmic veins or posterior into the petrosal sinuses, often dictates the clinical findings and radiographic appearance. Anterior drainage typically leads to the most dramatic ocular findings and enlargement of the superior orbital vein, the latter often detectable with CT or MRI. However, superior orbital vein enlargement is not specific to CCF.2 Additional radiographic findings with variable prevalence include lateral bulging of the cavernous sinus wall and enlargement of extraocular muscles on CT or MRI, and abnormal cavernous sinus flow voids on MRI.3–5 Conventional MRA reconstructed images rarely provide additional useful information. Direct visualisation of flow related hyperintensity on the source images of three dimensional time-of-flight MRA can be extremely helpful in CCF detection, with 83% sensitivity and 100% specificity, far superior to standard MRI.1 Examination of MRA source images is particularly useful in the absence of anterior drainage and superior orbital vein enlargement. Gadolinium-enhanced MRA source images do not increase diagnostic accuracy.1 In our patient, superior orbital vein enlargement and slightly increased flow voids in the region of the CCF were present on MRI, but MRA source images provided the most striking and direct evidence of CCF. Similar to other non-invasive techniques, MRA source images cannot delineate CCF arterial feeders or detect cortical venous drainage. Hence, conventional angiography remains necessary for definitive management. However, non-invasive techniques such as MRA source images have an important role in pre-angiographic diagnostic decisions. This manuscript was supported in part by a departmental grant (Department of Ophthalmology) from Research to Prevent Blindness, Inc, New York, New York, and by core grant P30-EY06360 (Department of Ophthalmology) from the National Institute of Health, Bethesda, Maryland. Dr Newman is a recipient of a Research to Prevent Blindness Lew R Wasserman Merit Award. Hirai T, Korogi Y, Hamatake S, et al. Three-dimensional FISP imaging in the evaluation of carotid cavernous fistula: comparison with contrast-enhanced CT and spin-echo MR. AJNR Am J Neuroradiol 1998;19:253–9. Chen J, Tsuruda J, Halbach V. Suspected dural arteriovenous fistula: results with screening MR angiography in seven patients. Radiology 1992;183:265–71. Keltner JL, Satterfield D, Dublin A, et al. Dural and carotid cavernous sinus fistulas. Ophthalmology 1987;94:1585–1600. Hirabuki N, Miura T, Mitomo M, et al. MR imaging of dural arteriovenous malformations with ocular signs. Neuroradiology 1988;30:390–4. Komiyama M, Yoshihiko F, Hisatsugu Y, et al. MR imaging of dural AV fistulas at the cavernous sinus. J Comput Assist Tomogr 1990;14:397–401.